The TC7660H is a pin-compatible,high frequency up-grade to the Industry standard TC7660 charge pump voltage converter.It converts a +1.5V to +10V input to a corresponding – 1.5V to – 10V output using only two low--cost capacitors,eliminating inductors and their associated cost,size and EMI. 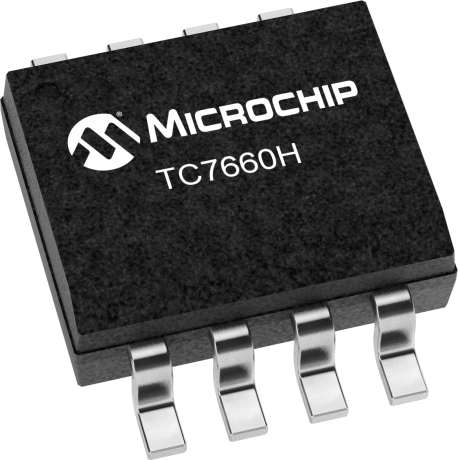 The TC7660H operates at a frequency of 120kHz (versus 10kHz for the TC7660),allowing the use of 1.0 µF external capacitors.Oscillator frequency can be reduced (for lower supply current applications)by connecting an external capacitor from OSC to ground. The TC7660H is available in 8-pin DIP and small outline (SOIC)packages in commercial and extended temperature ranges.